Welcome to Klahowya! From this beautiful and conveniently located property you'll see ferries and private boats float past your windows on their way through the islands. Let's start the day; follow the sunlight dappled entry steps from the driveway to the entrance. What a beautiful wooded setting. 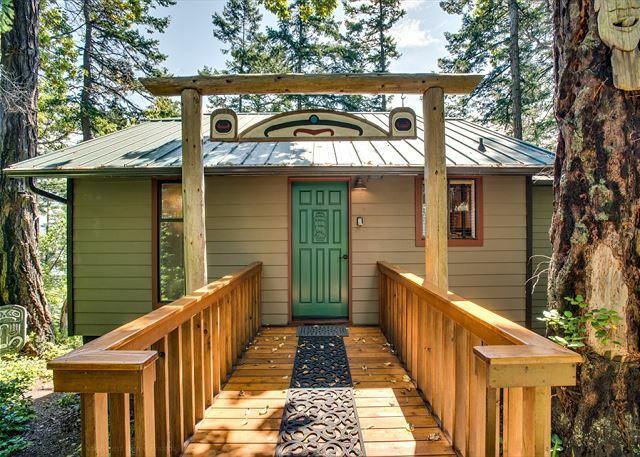 Special touches welcome you to this adorable cabin. 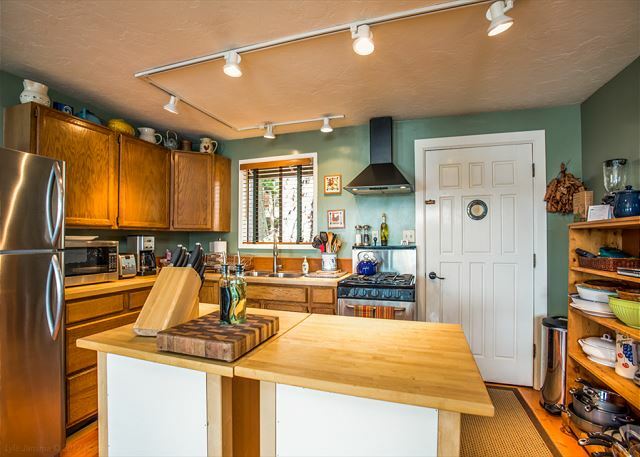 The kitchen is well equipped and features an island for food preparation and presentation. From the kitchen looking out toward the water. Another perspective looking at the entry door and the kitchen next to it. Stepping back a bit here is a view of the kitchen and dining room. Here is a look at the cozy 4 person dining room table. Inside or out you are sure to dine with a view. Another perspective of the dining room. You'll feel close to nature with these large windows. The home is clean and comfortable throughout making it a perfect spot to relax. Stepping outside for a moment take a look at this deck! The corner table is perfect for breakfast or dinner. Back inside through the living room you can see the chair on the right at the head of the stairs leading downstairs to the bedrooms. 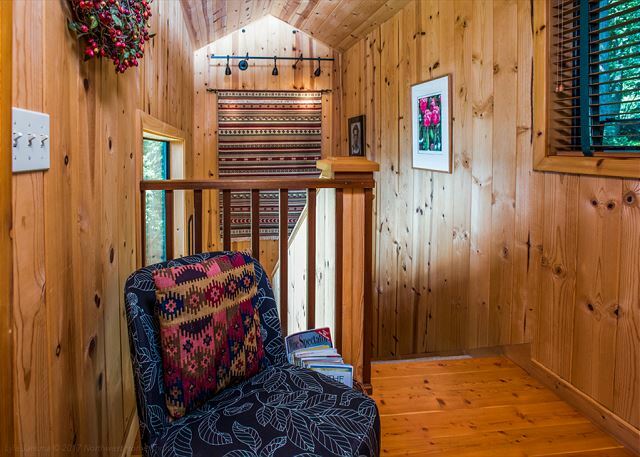 The knotty pine stairwell connects Klahowya's two floors. Once downstairs a sitting area next to the bed invites you to stay a while; discuss the adventures of the day before breakfast or recount the highlights of exploring the island at the end of the day. A full view of the master bedroom including sitting area in the foreground. A cozy spot for a movie after a day full of island play. A spacious bedroom with fireplace and view. Another view of the master bedroom from the opposite direction. A walk out deck from the master bedroom ensures you will not miss a moment of the sweeping magical views. Another view of the master bedroom deck. This newly updated bathroom is tastefully styled and offers a large tub & shower combination. A cozy guest bedroom welcomes you to a hard-earned rest after another wonderful island day. Stackable laundry and dryer come in handy for longer stays. 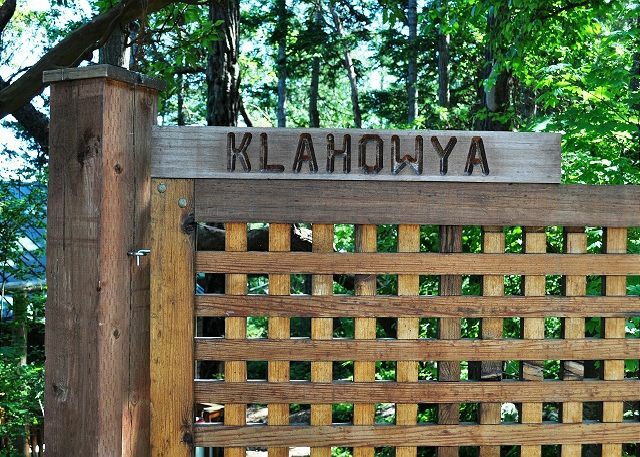 Klayhowya - means "welcome" in the native trade language of the Pacific Northwest. 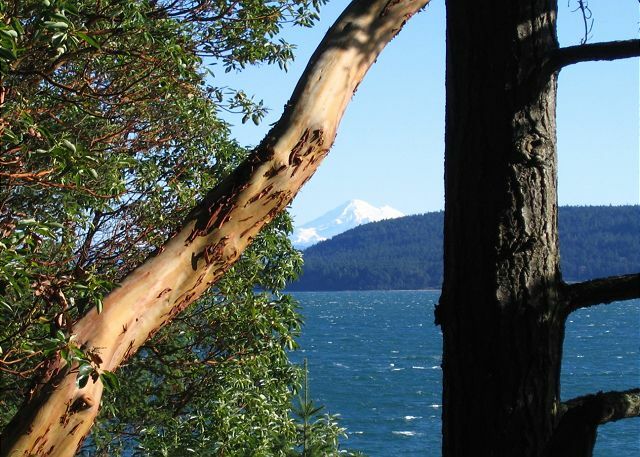 From Klahowya, you'll enjoy an incredible view of Blakely Island and Mount Baker beyond. Mount Baker makes another appearance behind Blakely Island. Another gorgeous day begins. Imagine waking up to this sunrise! Thank you for taking the time to look at Klahowya! You won't be disappointed with the amazing views this property has throughout the year. Well located as the first house on Lopez (1st house after the ferry landing!) No on blocked us in in 3.5 weeks. Mu wife loved the kitchen and its' equipment. There aren't many channels on the Direct TV but the wifi is strong enough to stream Netflix. This was our second visit to the San Jauns and our first to Lopez Island. Unfortunately, we were there during the week of heavy smoke from nearby forest fires. Staying at Klahowya, though, was a pleasure. The outdoor space alone makes it worth renting. While the description of the place is listed as "upscale," it is absolutely not. Comfortable, cozy, and convenient are better words to describe the home. The furnishings are showing some wear and tear and the house could use at least one king size bed. And as long as you don't mind being in the middle of ferry traffic lining up several times a day, it couldn't have been more convenient and private the rest of the time. We were there to celebrate our 35th anniversary, and it was one of the best anniversaries we've ever had! Yes, we would recommend but keep in mind that it is not a perfect house by any means. The rental was very clean, beautiful porch and great view overlooking the ocean. This was a perfect place for a spring escape to Lopez. We spent our days exploring in mixed sun and rain and loved coming back to this warm and comfortable home. Loved watching ferries coming and going, eagles and marine wild from the deck. The hummingbird feeder is a great touch. Nice to have a welcoming place for our 15 year old pup. My husband and I enjoyed staying at this property in September. The location near the ferry was convenient. The kitchen was well equipped, which was good since we cooked and ate in quite a bit. The bathroom was great, but we wished it had been downstairs with the master bedroom. 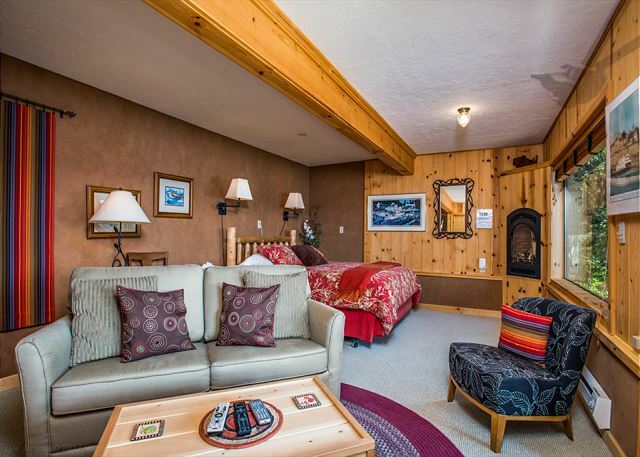 The bed was comfortable and the fireplace was perfect for chilly evenings and mornings. We enjoyed watching TV from the comfy couch in the master as well. Of course the star of this rental is the view! Looking out at the water and all the natural beauty was mesmerizing. I was fortunate to be up before the sun one morning, and the sunrise coming up over the distant island and reflecting off the bay with all its colors was spectacular! The house was very clean and had everything that we needed. The view was perfect and so relaxing. I loved the deck and we ate every meal on the deck. A beautiful house, with a beautiful view, well-furnished, well-equipped kitchen, great location (especially for the ferry line!). Only comment is it is inconvenient not having a bathroom downstairs with the main bedroom, especially if you had four people in the house. I suspect there is a downstairs bathroom that is locked by the owners. If there is, and it was opened, we would be back. We loved our trip to Lopez Island. It is such a beautiful place - from the deck of the house you can just watch the world go by. Other reviews are accurate - you're close to the ferry but it is in no way bothersome. We actually liked it the day we left because we could easily get in the ferry line and then hang out at the house. The island is so beautiful - just enough to do but still has a sleepy vibe to it. The house itself was really nice and very well maintained. 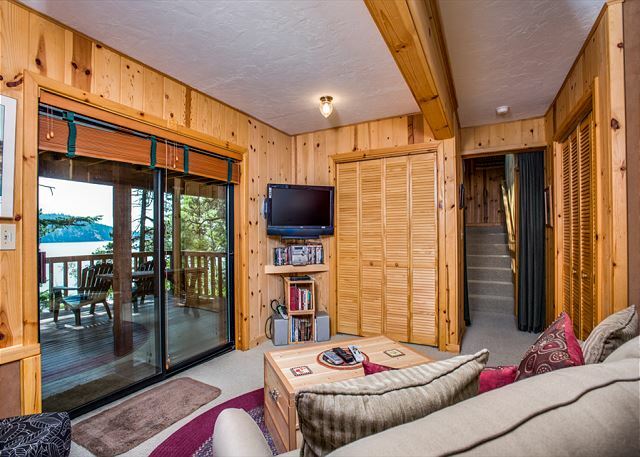 This waterfront cabin was ideal for our Lopez laid-back vacation. Isolated, yet close to the ferry terminal, great for island hopping. 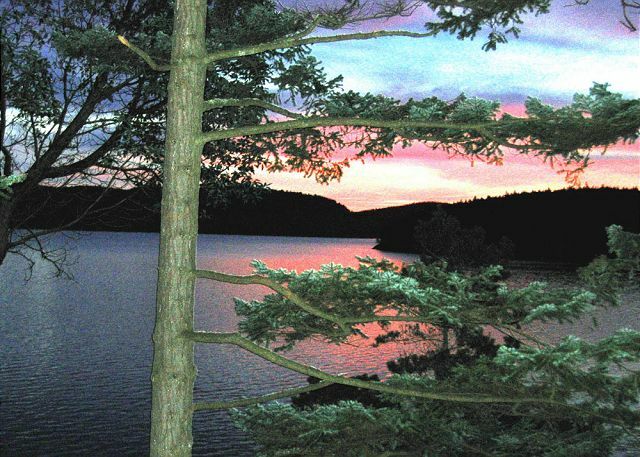 River otters, raccoons, deer, eagles and great forest walks all within the area. Very comfortable, clean and very well stocked. A car is a must at this location for exploring other portions of the island. I would very much rent this cabin again. This was our first time to the islands and it could not of been a better experience! We got to watch the sun rise, the sunset, the moon rise and the moons illumination on the water was amazing. The house was the perfect size for a small group or just a couple and all the amenities were there a make us very comfortable. We'll be back!!! Amazing location with ability to watch the ferries arrive and depart. The cabin was well stocked and clean. Our family of 5 stayed here comfortably for 5 nights and we were still sad to leave this little vacation paradise. 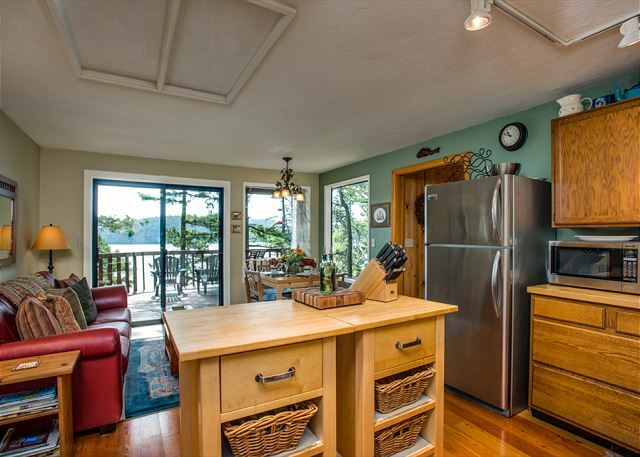 Ample kitchen supplies, DVDs, bedding options, BBQ and two spacious decks. We highly recommend a visit to this charmer and will definitely go back again ourselves. Thanks for a very inviting and relaxing get-away! This vacation home looks out on the water with a great view of the ferries coming and going. Located very close to the ferry landing but a short drive to the village , the queuing cars for the ferry out front don't present a distraction because of the homes location down the hillside. The beds were comfortable, nights are cool great for sleeping. Coffee on the deck in the morning watching the boats come and go is not to be missed. Our only negative is the sauté pans and some of the dishes were not as clean as they should have been and could use curtains in the living room / dining area .Overall a conveniently located property with a great view. We really enjoyed staying in the home. It was perfect, loved the two decks. I think it would have been nice if there were two bathrooms, but we made due. Perfect HQ for exploring the islands. We are parents with 2 teenaged sons. Perfect house for us - kind of rustic/elegant. Beautiful views on a quiet island. Benefit to have it so close to the ferry - can park your car in line and return to the house 'til it boards. 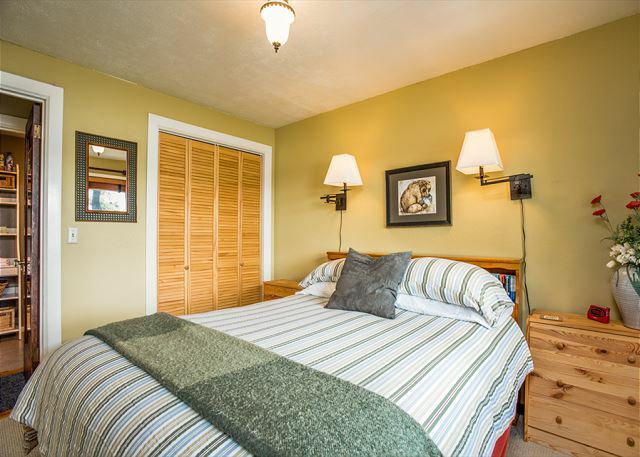 House is well-maintained w/comfortable beds & linens & stocked with everything you'd need to cook. Better than average market close by. We loved it. Our stay at Klahowya was wonderful. 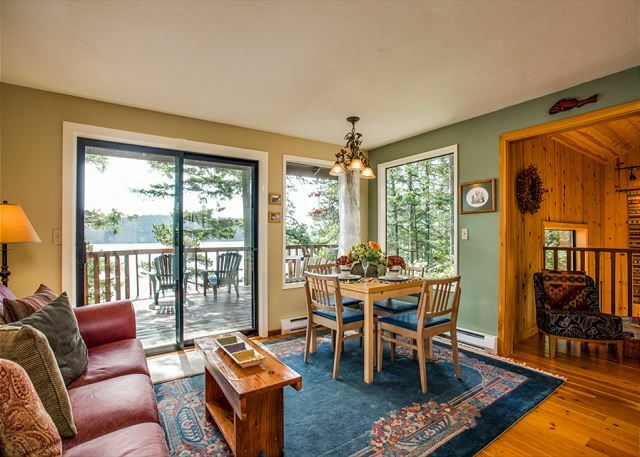 The house is close to the ferry landing, making it very convenient to walk or drive onto the ferries. We were concerned about noise from the ferries but with the windows closed, we rarely heard their horns. The porches are large and offer beautiful views of the water and ships passing by. We thoroughly enjoyed our stay. One suggestion: we could have used an empty cupboard to store the food supplies that we brought. Thanks for making our stay a memorable one. 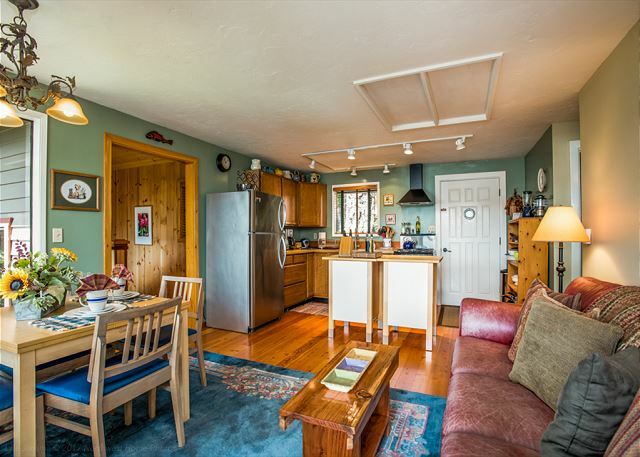 Excellent cabin right on water and walk to Ferry, get quiet and relaxing. Close to downtown area (2-3 miles) with great walking trails nearby. We spent 3 days exploring Lopez Island and one day to San Jyan for a kayak trip- nice variety for our 4 night stay. Cabin was exceptionally clean and kitchen was well- stocked. We would return to Klahowya! Klahowya just might have the prettiest view on an island that features spectacular views in every direction. The house was charming, clean, and comfortable- from the fluffy towels to the (apparently) ironed sheets! Coffee on one of the stunning decks in the morning was a vacationer's dream. (If you add a pastry from the local Holly B's bakery: heaven!) Note: We did wonder if the proximity to the ferry might be a problem due to noise or traffic, but it was not. We never had ferry traffic block our parking area, and the house feels quite private in its woodsy setting. We thoroughly enjoyed our stay at this house which is VERY conveniently located near the Lopez ferry landing. The location made it very easy to island hop during our stay. The house wasn't fancy but had two lovely decks facing the water and was well appointed. We enjoyed a thoroughly restful and restorative week on Lopez Island at Klahowya. The cabin was perfect for my husband and I and our small dog. Tastefully decorated, and well-appointed, with serene water and island views--we had everything we needed to feel comfortable, and relax. We spent the majority of each day on the generous deck over looking the water--reading, playing boardgames, eating seafood from the nearby fishery. We were happy to be at the cabin just the three of us, we could envision another couple for a few nights but the cabin may feel cramped as the common space is limited and there is only one bathroom. The kitchen is stocked with every appliance one could need (blender, crock pot, coffee maker, wine bottle opener, etc) and basics such as herbs, salt & pepper, and a britta water filter pitcher are provided. The cabin is the first driveway south of the ferry--one is aware of incoming and outgoing ferrys and can hear the announcer via loud speaker, and cars are parked out front frequently, but it really was not a nuisance as the terminal is small and the energy is low/ peaceful. Loved, loved, loved this rental property! Two couples, enough space due to the beautiful deck. The ferry landing is close, but that wasn't a bother. Loved being on the water and in the trees. If there is a downside, it's that there is only one bathroom. It was very positive and no complaints. Everything was in order and organized as we had understood it to be. What a beautiful island and rental home - my only comment is that the downstairs bedroom needed 1/2 bath but everything else was fabulous - loved it! It was an easy walk up from the ferry with our bikes. The home had everything we needed for a really wonderful stay! Easy Does It On Lopez! Great place to stay to meet up with family and friends. Went to the Island for a family reunion and some relaxing. The home served as a great spot. Views were just as described. Star fish left by the moving tides each morning were fun to see. Listening to the ferry come and go in the early morning fog was strangely peaceful. Kitchen could not be more complete - anything and everything you might need is there. This house is even more lovely than the pictures. The location is great, you are right on the water, not far from the village. The place was clean and very well furnished - well stocked with handy items. We LOVED it. This home was well-maintained. The view from the deck was simply amazing! Bald eagles and otters played nearby and there was an incredible path to explore across the street, Indian Head Preserve. 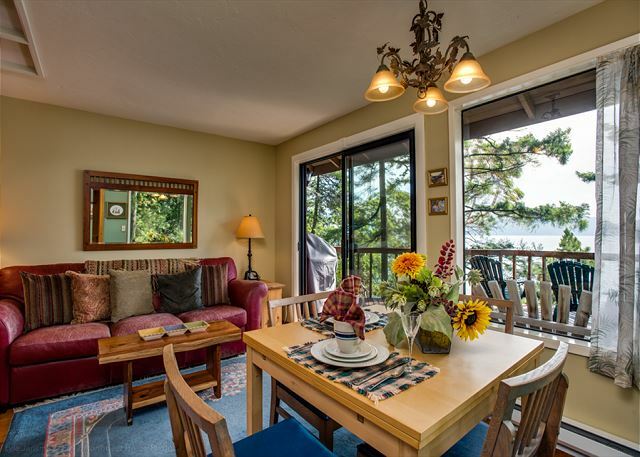 The home is located close to the Lopez Island Ferry landing, which makes trips to the other islands an easy commute. Our stay on Lopez island was perfect. We had never been to this slow-paced gem. As you drive around the island, everyone waves and makes you feel at home. Our house rental was in a perfect location. While it is a smaller house, it makes great use of space. It was perfect for my husband and I and our two dogs. We ate most of our meals out on the deck, when it was warm. The house has all you need. Beds are cozy although, I would have liked to see a king bed downstairs. If you do leave the house for sustenance, check out the Love Dog Cafe, excellent food and great fresh ingredients. Also, La Boheim Coffee is unbelievable . Excellent place...would definitely stay here again. My husband and I liked everything about this place. The location near the ferry was very convenient for island-hopping, the decks were great places to hang out, the house was immaculate. We enjoyed our stay immensely. We had a lovely weekend on Lopez. The house is very conveniently located right off the ferry so it would be very easy to walk/bike over to the island without having the hassle of ferry waits. The kitchen is well stocked much more so than other rentals although we did find a need for cheese grater, muddler and garlic press so pack this with you. Both beds were extremely comfortable and supported multiple naps. Hands down the best part of the house is the view out to the water. I was worried that it would be a peek-a-boo view, but it is straight on and amazing. We were visited by a baby seal and able to see multiple starfish down on rocks, plus an eagle and resident hummingbird. This house is a real find. This cottage provided us with a cozy place for a week long stay. The beds were comfortable. The kitchen was well equipped and easy to use open to the living area. The down stairs "suite" allowed for two adults to share the house easily with separate space. Easy walk to the ferry. The only suggestions I would make to improve an already wonderful spot: more specific directions to house since numbers and sign are hard to see; stainless cooking instead of Teflon; and hypo-allergenic laundry detergent. HIghly recommend this rental! The views and accommodations lived up to, and exceeded, the pictures on the website. The design of the home allowed you to enjoy the views throughout. We really appreciated the well equipped kitchen. We have never stayed at a VRBO that had so many pots, pans, and appliances to choose from. Upon our arrival we noticed a problem with the electricity. A simple call to the contact number resulted in a quick response and resolution of the problem. The owners exhibited a sincere concern about our stay and worked to ensure that all was taken care of so our vacation would continue without interruption. We had a great time staying here! Within easy walking distance of the Ferry Landing and a short drive to Lopez Village for shopping/groceries. Fantastic view of the Sound! Really appreciated the selection of DVD's to watch in the evening - got some popcorn from the grocery store and it felt just like home! The house was wonderful - the perfect vacation get away and the staff at Windermere were extremely helpful and quick to respond to any questions. The house has a really great view facing east out to the bay. Morning sunrise views from the bedrooms! Our two kids shared the upstairs bedroom and the adults took the downstairs. We rented bikes and got around Lopez pretty easily although the house is located at the northernmost end of the island so any trip to the south end will be about 27 miles round trip. It's only a few miles from the village though, so pretty convenient for groceries etc. We had a great time and would recommend this house for a close family with young kids or two couples. Beautiful views, convenient location, well stocked house, and clean property. Thoroughly enjoyed our visit. Very professional management. 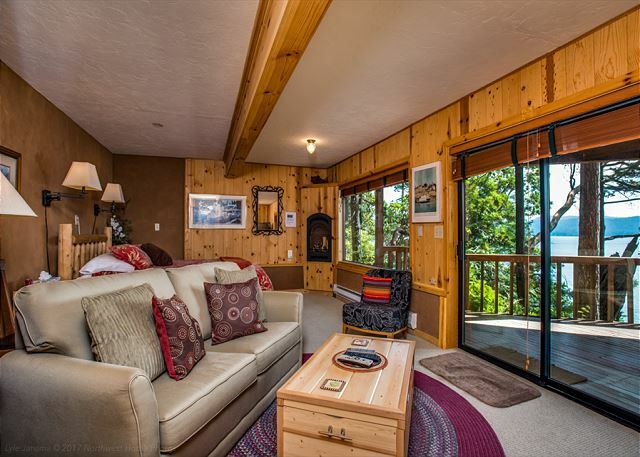 The view was incredible, home impeccable and fully furnished and stocked. Bald Eagle joined us for breakfast on deck. And the fact we could bring our two dogs along was a big bonus! What a wonderful experience. A beautiful home. It would be our hope to return next summer and stay two or more weeks there. Minor issues: We were confused about the number of TVs available---expecting one in each bedroom--- but the property management company answered our questions in a very professional manner. The floor needed a sweep and the chandelier had a cobweb or two but otherwise the house was very clean and comfortable. Thank you for allowing us to enjoy your wonderful place. We loved our stay here! The view is amazing and peaceful and we spotted golden eagles and bald eagles. 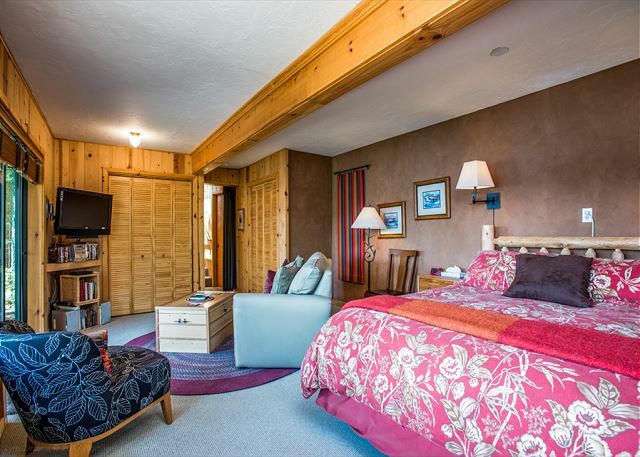 The home is quite comfortable and well appointed and we found Lopez to be a nice place to stay for a quiet winter getaway. The one hitch was that we were given an old combination to the lock box and had to make a couple of calls and then wait for a call back with the new combo. This wasn't a huge deal, but we were anxious to get in and unpacked, so the 25 minute delay was disappointing. Once we were settled in to the cozy home, however, it was worth the wait. We enjoyed a few really great hikes and had a couple of meals out (especially enjoyed the Vortex Cafe for lunch). We wish we could have stayed longer! Nice space nice location unbelivable weather. 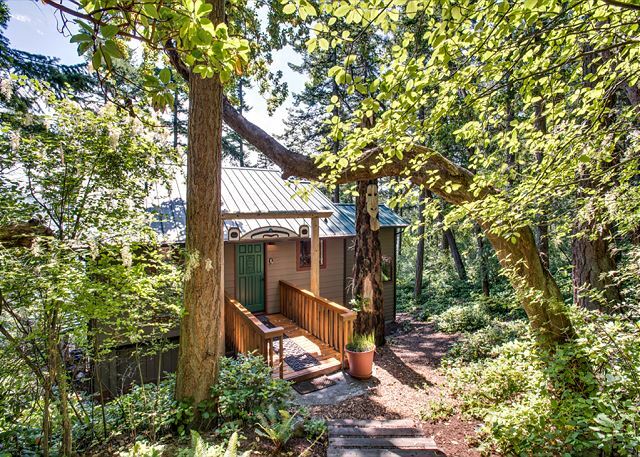 We enjoyed this very private and tucked away tree house. Comfortable and cozy. We will be back. We had a great time. Everyone was very friendly on the islands. The home was comfortable with everything we needed. We would love to go there again. Thanks. We chose this house because it promised close contact with eagles, and we were not disappointed. In our brief stay we saw a pair of eagles several times, both right next to the house, and in the Upright Preserve in back of the house, which is where they nest (and is a great place to walk). The house is terrifically well equipped if you like to cook (I baked a loaf of bread there), and the cook gets to watch the sea while he/she works. We slept upstairs, though the downstairs bedroom/den with gas fire looked comfortable. Some guests have commented about the ferry noise. Sometimes being so close to the ferry was a nuisance. But the surprising thing was that the noise was minimal, and the house feels very private. The eagles think so too. We would definitely go back. We had a great time but wish there was more to do during the week. there wasn't anyplace good to eat during the day. Klahowya was a nice place to stay for a long weekend. The views are spectacular and the house is very nice. A few of the details were missed (toilet paper, trash bags, coffee maker), but I am sure that those were just oversights. We really had a lovely time on Lopez Island and would happily return. We are sorry for the inconveniences! In addition to the espresso unit, the owners are now supplying a standard coffeemaker. We regret the oversight of the paper products - these are typically always plentiful, and we apologize that housekeeping neglected to put out a sufficient quantity prior to this early seasonal stay. Thanks Mark! Klayhowya is truly a delightfu spot. See you again, soon! We spent ten wonderful nights at Klahowya. You can cross the road and hike to Upright Head Preserve which we did our first morning there. We were delighted to find seals and harbor porpoise frolicking in the water when we got to the end of the trail. We sat on the upper deck one afternoon and watched three otters playing on the rocks below Klahowya. Waking up to the beautiful sunrises every morning was incredible. We also enjoyed the madrona trees growing through and right off the deck. You can drive around the island and find more amazing places to hike, Shark Reef Point would be a don't miss! We talked with a local woman at one of the co-op art galleries and she told us about the local farm stands, so we enjoyed cooking local island meat and produce that we picked up at farm stands around the island. There is a farm on the island called Horse Drawn Farm and their farm stand had a wonderful selection of locally grown food and the farmer doesn't use a tractor, we actually saw him in the field with a harness on his horses. The house has been masterfully supplied with everything you need to enjoy your time there. They even had a coffee grinder if you want to bring your own beans! I guess our one complaint would be the Foreman Grill on the deck, it really doesn't work very well! 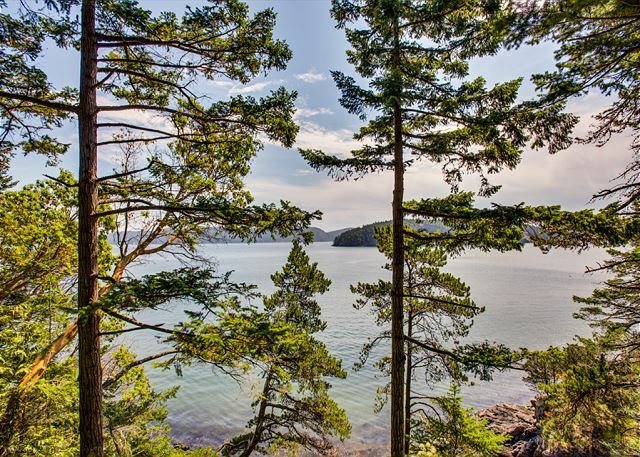 The home is so close to the ferry terminal that you can walk down and get on the ferry to Friday Harbor on San Juan Island or go to Orcas or Shaw Island. 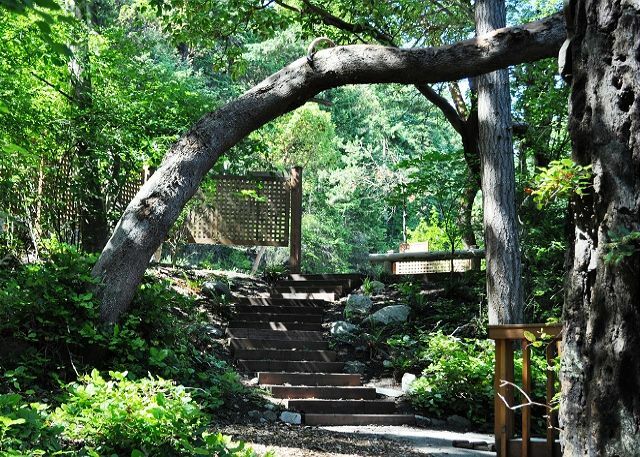 On your return to Lopez Island you just walk up the hill and you're home! If you are up early enough there is a little local coffee shop (The Krusty Krab) for the early morning ferry customers, just a short walk from the house. The owner doesn't stay open very long so you have to get up early! I would highly recommend this property if you are looking for a beautiful setting with a well equipped house to relax, de-stress and enjoy nature! Thank you for sharing your property with us! My husband, infant, two friends, and I stayed at Klahowya for the weekend. Our main complaint was that we weren't staying a week! We loved the house, view, outdoor space, and placement of the house nestled in the trees. It gave the feeling that you were in a remote, secluded location but with the convenience of the ferry and gorgeous view of the water and neighboring islands. If I had to be nit-picky, the duvet downstairs had hairs and needed to be cleaned, the shower did not get hot, just warm, and a check out time of 10am is pretty early when we arrived at the house after 10pm on Friday night. It we had stayed for a week it wouldn't have mattered. It really was a great weekend and we really enjoyed exploring Lopez Island, although we hated leaving our adorable rental property! My wife and I wanted a change from the heat and dryness of Arizona. We experienced cool, damp weather and reaxing views of water and islands. We thoroughly enjoyed our stay at Klahowya on Lopez Island. From the starfish on the rocks below the deck to the neighborly folks in the village, we were warmly received. The house was very clean and quiet. Each day we took a short walk to the Ferry and traveled to a different island. It was a relaxing and enjoyable honey moon. We enjoyed our stay on Lopez Island very much. Klahowya was just perfect for our first trip to explore this island. Having the Upright Head trail and lookout places just outside the front door is amazing! The moss covered trail, beautiful trees and wonderful places to view the waterways were wonderful! The house and the view of the water from both inside and outside on the deck had just the beauty we were hoping to find for our stay on Lopez! We had a lovely stay - the house is great, loved the deck and the views. Our only recommendation would be to upgrade the George Forman electric grill to a gas or charcoal grill. That one did not really get hot enough to cook a good steak! When you return you'll find a new gas BBQ for your steak! Glad you had a great stay. a guest from Port Townsend, WA does not recommend this vacation rental. general noise from ferry line. It's not intolerable and the view on the other side is so great, but there is this feeling of being a part of the ferry parking lot. On the other hand, the cottage itself is beautiful with everything you could possibly need. I've never been happier with the aesthetics of a vacation rental. if only this place was a 1/4 mile down the road! I think the ferry traffic would not be nearly as disruptive at other times of year....this is end of August and so peak time and peak lines. would not compromise privacy. No downstairs bathroom. Smaller than pictured, and no TV in 2nd bedroom. Madrona trees are gorgeous, but beware; patio furniture is pitchy. Staff were extremely helpful. convienence of walking on a ferry and going to the 'busy' touristy towns on other islands. A few nice restaurants and a well stocked grocery store. Overall, couldn't ask for more. We're happy to be part of it! My friend dog and I really enjoyed our trip. In spite of it being 50 feet from where the cars line up out front, it was amazingly quiet. The lattice fence in front and all the trees block the traffic pretty well. The only thing which would have been nice is a dishwasher. The house has a well equipped kitchen, but its small. Not really fun to have to wash dishes on your vacation but we managed. Also the management company did not know whether the house had a dishwasher or not. 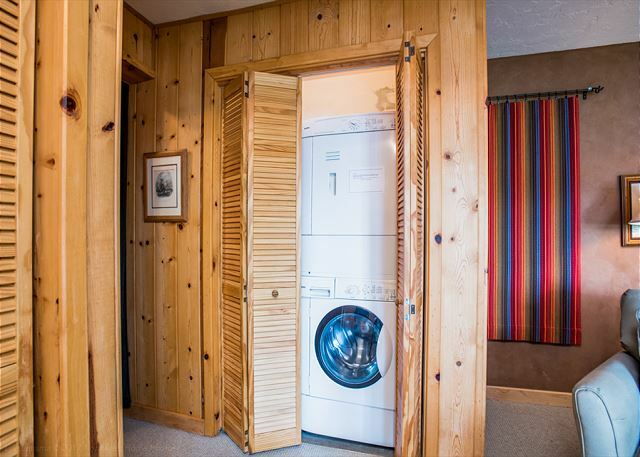 Surprising since it did have a full size washer and dryer. A high bank setting makes for an awesome view from the upper and lower way to hike down to the water and no beach area below to speak of. If your wanting to walk along the beach or lay out in the sun, Spencer Spit is your only real choice. It will cost you $10.00 for a day pass or $30.00 which covers all parks in the state for a year unlimited.Oh and both beds in the bedrooms are extremly comfortable. We slept like a rock!! We're glad that you had a nice stay at Klahowya. Following your feedback about the tap water, we had the system fully inspected, found no issue, and have had no reoccurence of the scent, leaving us with no explanation of your experience, but we certainly regret that you found the water distasteful. Of concern is that you found some charges "questionable." Our policies, website display, and rental agreements clearly itemize all charges, including the cleaning fee. Renters have the option providing a fully refundable security deposit instead of a non-refundable damage waiver. Had that option been selected, you would not have been charged for the waiver. It is a wonderful house with the sea and the forest. It was a great place for a reunion. On arrival we were greeted by a humming bird and bald eagle. We cooked great meals,ate on the deck and relaxed.Love to returnLopez island was a very relaxing laid back place to stay. I had always wanted to go to Prince Edward Island after seeing Anne of Green Gables but Lopez Island seemed similar. It has everything, the sea, forests, wildlife and lots of happy sheep and farms. The ferry trip was fun and felt like we were leaving the chaos of the mainland and arriving in a calm and peaceful place. We all felt so relaxed after our stay. Highly recommended both Lopez and Klahowya. Lots of cooking supplies which was nice. The house was very comfortable, cozy, has a great view and was quiet even when so close to the ferry traffic. The house was in a great location to the ferry, Oslin Park, Spencer Spit Park and the Village which was nice! The bathtub plug did not work and the fireplace did not work which was a bummer, but everything else worked. We're sorry about the bathtub plug and fireplace issues - wish that you had called us so we might have remedied the problem during your stay. The house has been (recently) remodelled, and has a nice feel. Fairly well set up. Lovely deck, with a "resident" eagle pair nearby. I had thought there was access to the beach, but found it more like rock climbing...disappointing, but still, a great setting. The ferry proximity (line, announcements) were interesting rather than bothersome. We had a great stay! We had a relaxing stay at Klahowya and are looking forward to returning in September. The property is very close to the ferry dock and people can be loud while waiting for the ferry. This was only an issue a few mornings as people lined up for the 10 AM & noon ferries. The kitchen is well stocked which makes it easy to cook & enjoy the produce on the island. All in all, a lovely stay. A fine location and wonderful setting among the trees; a veritable tree house. Ran out of toilet paper and paper towels halfway through the week. The Windermere agent and the owner were unable to get the dripping faucet fixed while we were there as it was a holiday weekend etc, but it was annoying and I hated wasting all of that water. We stayed at this lovely home in January - a perfect weekend getaway. Well appointed, and the home is very private despite its location and size. We enjoyed the spacious decks with gorgeous views. Beds are very comfortable, and the kitchen is well appointed, Nicely decorated with touches to make you feel right at home. We would definitely stay here again! So glad you enjoyed the home! Please come back! Found a petrified pancake in the oven, could happen anywhere. Towels were a little sour smelling, house had stron odor of cleaner, but once we put the dust cloth outside, the odor went away. All small stuff, we did have a great time!! Oh, steak knives would be great. 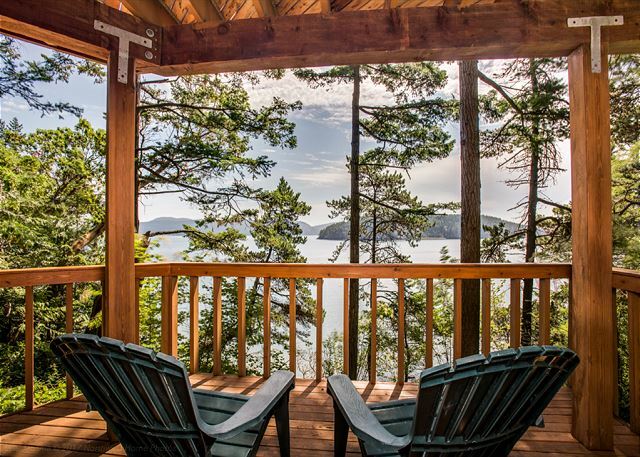 We love Lopez Island, and this is the nicest accommodation we've yet found on the island. An easy five minute walk from the ferry terminal, yet quiet and peaceful, with a fine view of the water, comfortable decks, a gas range and pretty much everything else anyone might wish for. We were very pleased and will return. The property was very delightful. I was not aware it was so VERY close to the ferry and that cars would be lining up directly in front of the house, thought I found that much less bothersome than I would have thought. This was nonetheless not represented clearly by management. The only other negative was that in dealing with Cathy to set up the reservation and rental transactions, I found her to be rather confusing, and contrary. But things got worked out and overall the rental was great. Wonderful view. We strive for positive interactions with every guest. We regret that your transaction was difficult and are glad that the overall experience was a good one. Very cute, I would come again. Very nice home. Got to see mother otter with babies playing water below deck. Bald eagle landed in the treet next to the dack. Beautiful Island. Management should let potential renters know that property is the first propert next to the ferry. Can get very busy and traffic did start to congregate early for popular departures and during other during departures and arrivals it could get pretty busy on the street out side the house. This however did not disturb sleep. On the upside to the location was the ease of boarding the ferry for day excursions without the car. Overall experience was quite good. We couldnt get the gas fireplace to work.